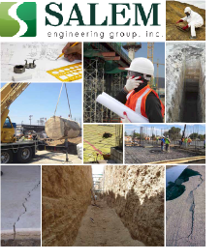 Site Assessments and Remediation – Salem Engineering Group Inc.
"Our unique perspective allows our team to clearly understand our clients’ project objectives; therefore customizing an approach specific to each project, while minimizing liability and protecting valuable assets." SALEM Engineering Group, Inc., has been a leading provider in environmental consulting services for more than 15 years. SALEM’s staff of highly trained and experienced environmental assessors, field geologist and hydrogeologists have conducted thousands of due diligence assessments and remediation on many properties throughout the United States. SALEM continues to provide progressive, professional, and practical consulting services and offers straight-forward, cost-effective solutions to a wide variety of environmental issues. Our vision, coupled with our commitment to our valued clients, quality work, and exceptional standards, is the key to our history of success. SALEM’s staff of highly trained and experienced environmental assessors has conducted thousands of Phase I ESAs throughout the United States. A Phase I ESA is an integral part of any commercial real estate transaction that are routinely conducted as part of ownership transfers, sales, new mortgages or refinancing of commercial real estate in order to satisfy lender requirements, evaluate the existence of Recognized Environmental Conditions (RECs), establish the “Innocent Land Owner” defense under the Comprehensive Environmental Response Compensation Liability Act (CERCLA), improve the quality and value of real estate portfolios, or estimate potential remediation costs for purchase agreement negotiations and development plans. The scope of the Phase I ESA is conducted in accordance with the American Society for Testing and Materials (ASTM) Standard 1527-13 and the USEPA’s All Appropriate Inquiry (AAI) standards. The Phase I ESA is an important document that can protect the current property owner and prospective purchaser from environmental liability. The Phase I ESA will identify and analyze potential environmental risks associated with the subject property and area properties of environmental concern. The Phase II ESA may include soil, soil vapor, groundwater and surface water sampling in areas suspected of having been impacted by an unauthorized release of hazardous materials/hazardous waste. If an environmental hazard is identified or if a known hazard exists based on past usage, a Phase II ESA will evaluate suspect areas identified on the subject property. Soil samples are collected utilizing various types of equipment including hand augers, a Geoprobe®, or a drill rig. Soil and soil vapor borings are advanced in suspect locations. Groundwater samples are collected from the borings or permanent monitoring wells located on the subject property. Samples are collected, preserved and either analyzed on-site utilizing a mobile laboratory or shipped off-site to a State-certified laboratory according to standard industry methods. The Phase II ESA report describes the soil borings completed, soil texture, soil and groundwater analytical results, and presents the data in tabular format with a map illustrating the sampling locations on the subject property. Conclusions are drawn from the available data collected on-site, regional and local information available. If conditions are identified that may require remediation, the recommendations section of the report will discuss general options available. The completion of fieldwork will vary depending upon the complexity of the scope of work required to delineate and assess suspected areas of contamination. All investigations which involve the collection and interpretation of subsurface data are performed and managed under the direction of licensed and experienced SALEM geologists. A typical Geophysical Survey entails employing EM-61 high sensitivity metal detection equipment, shallow focus terrain conductivity, ground penetrating radar, and electromagnetic utility-locating methods. A field survey of the area in question is conducted and scanned with equipment. Many times, areas of potential concern are notated in the field, however, the data generated by the survey is documented in a letter report and submitted to client. Often times, when a geophysical survey is conducted in conjunction with a Phase II investigation, the survey data is utilized to further define the Phase II ESA scope of work to further assess environmental impacts to the subject property. In-situ sampling using hydropunch or temporary casing methodologies. From large refinery projects with quarterly groundwater sampling of more than 300 wells, to small periodic groundwater sampling events associated with closure monitoring, SALEM personnel have extensive experience with the operation and management of groundwater monitoring programs using a wide range of sampling techniques. Closure testing and No Further Action (NFA) report submittal. Groundwater pump-and-treat (primarily for gradient control). The purpose of a Soil Management Plan (SMP) is to provide an approach for management of soil that has been impacted by constituents of potential environmental concern (COPCs) that may be encountered at a property when it is disturbed during construction or renovation. Soil that is encountered during grading or excavation that appears to be impacted, or is confirmed to be impacted with COPCs, must be segregated and managed according to the standards set forth in the SMP during construction. In addition, soil that exceeds applicable regulatory agency screening levels requires the identification of appropriate waste acceptance facilities, waste profiling, and removal from the subject property. Excavation and grading activities may also generate volatile organic compounds (VOCs) in ambient air that exceed air quality guidelines; therefore, notification and monitoring is frequently required when soil is disturbed during construction-related activities. Failure to prepare an SMP before construction-related activities begin can result in significant delays and unanticipated construction costs. SALEM’s team of environmental professionals design the Phase II environmental site investigations to identify conditions that can trigger the need for an SMP, and work with our clients to prepare and distribute the SMP before excavation begins at the project site. SALEM personnel prepare and submit the necessary air monitoring permits to the applicable regulatory agency and perform required air monitoring (using an organic vapor analyzer or PID) to determine if excavated soil should be segregated and stockpiled separate from “clean” soil. Stockpile sampling is performed to determine if the soil can be re-used on-site or if it requires special handling and off-site disposal at a licensed waste acceptance facility. SALEM identifies the appropriate disposal facility, profiles the soil, and hauls the soil off-site for disposal (or assists with the general contractor with soil disposal if requested). SALEM has prepared SMPs for refineries, big-box stores, gasoline service stations, metal plating facilities, and commercial properties throughout California. More than 500,000 underground storage tanks (USTs) are utilized nationwide to store petroleum-based products or other hazardous substances. The greatest potential threat from a leaking UST is contamination of groundwater, the source of drinking water for nearly half of all Americans. Releases from USTs can also result in human health risks due to inhalation (including indoor air risks from exposure to volatile constituents) and ingestion/absorption (due to contact with contaminated soils). Older USTs were historically constructed of steel, which has a tendency to corrode and leak over time. Tanks installed in the 1990’s were typically constructed using fiberglass or fiberglass-coated steel with secondary containment for additional leak protection. Today, state and federal regulations are in place to ensure that USTs are registered when they are installed, and document that the USTs are regularly maintained to minimize risks to human health and the environment. USTs are commonly identified during property transaction-related environmental due diligence assessments; however, data gaps may exist that necessitate the performance of a geophysical survey using electromagnetic magnetic induction (EMI) and ground penetrating radar (GPR) investigation methods to identify potential USTs, associated appurtenances, or a backfilled UST cavity. Once a UST is identified and targeted for removal, several preparatory steps are required: 1) Identification of the proper Certified Unified Program Agency (CUPA) to provide regulatory oversight during the removal process and certify the proper closure of the UST; 2) Determination of the tank size and historic contents; 3) Regulatory agency permitting for excavation, UST removal, and air monitoring; and 4) Underground utility clearance marking and notification. After permits are secured, soil is excavated and temporarily stockpiled on plastic sheeting near the excavation to expose the UST. Residual fluids are removed using a vacuum truck. The UST is then de-gassed, triple-rinsed, and certified clean by an industrial hygienist. Air monitoring is performed during excavation and tank removal activities using a PID. Under the direction of the CUPA representative, the UST is removed and inspected, loaded onto a flatbed truck, and transported off-site for recycling or disposal. Soil samples are collected from below the tank and along the excavation sidewalls to evaluate soil conditions. After sampling is completed the excavation is backfilled, compacted, and re-surfaced. A UST closure report is then submitted to the CUPA to document the activities, summarize analytical results, and present conclusions and recommendations. Volatile organic constituents (VOCs) in subsurface soil and groundwater can migrate upward through the soil, enter into buildings, and expose building occupants to unacceptable human health risks. The most common VOCs are associated with aromatic compounds found in gasoline, chlorinated solvents used in metal cleaning or dry cleaning processes, and methane gas originating from landfills or abandoned oil fields. After identifying data that suggests the existence of a potential vapor intrusion risk, a soil vapor survey is performed to specify and quantify the constituents of concern. If the human health risks or the potential for ignition/explosion of soil vapors (typically from methane) exceeds regulatory thresholds, the soil vapor can be remediated or a vapor barrier can be designed to allow for development of the property. The final vapor barrier design will vary according to the potential risks, ranging from a 12 millimeter thick vapor barrier for sites with low-level vapor impacts, to a 60 millimeter thick vapor barrier with a sub-slab ventilation system for sites with elevated concentrations of VOCs. SALEM coordinates with the developer’s architectural and engineering (A&E) firm and incorporates floor plans, roof plans, elevations and main cross-sections, and foundation plans in the final vapor barrier design. The final vapor barrier design package is suitable for submittal to cities, counties, or regulatory agencies involved in the construction permitting process.